Last week while returning home alone from Lafayette, Louisiana (Yes, I left Norma Jean to enjoy our new granddaughter), I was listening to music, reading road signs and generally anything to stay mentally alert. Somewhere along I-20, I noticed this billboard with a great message. People read the Bible for many different reasons. Some read out of a rote habit of daily Bible reading. Some to reinforce what they already believe. Others for devotion and inspiration. And some may simply read out of obligation because that’s what good Christians do. This road side message succinctly offers three really good reasons for regular Bible reading. (1) Read Your Bible to Learn the Truth. While many today deny there is anything called absolute Truth, Jesus Christ prayed to the Father for future believers, “Sanctify them by your Word. Your Word is Truth (Jn 17:17). For You are the God of my salvation. On You I wait all the day” (Ps 25:5). However, you cannot read scriptures in isolation from one another and expect to learn the truth. 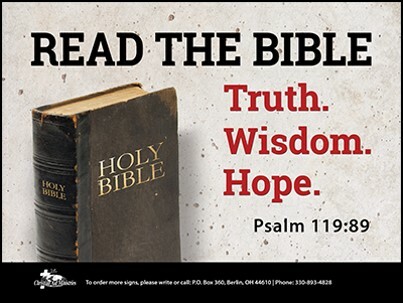 The sum of God’s Word is Truth (Ps 119:160). To understand the truth requires diligent study. Thorough examination. And honest evaluation. Truth is further illuminated in the person of Jesus. He affirmed, “I am the Truth.” His message, ministry and model for living provides us reliable access to the Father. In fact, He’s the only way to the Father (Jn 14:6). To paraphrase C. S. Lewis, if you’re reading the Bible to learn the truth, you will find truth and comfort. But if you’re just reading for comfort, you may miss both truth and comfort. (2) Read Your Bible to receive Divine Wisdom. There are two kinds of wisdom. Worldly wisdom and Divine wisdom. The wisdom of the world is carnal. It’s steeped in the erudition of human experience. It’s often arrogant. Godless. And self serving. Like those in ancient Greece who dismissed the gospel as simplistic and foolish (1 Cor 1:18-31). Divine wisdom is rooted in the character of God, demonstrated in the life of Christ and revealed in the Bible. Jesus’ brother, James, describes it this way. “But the wisdom that is from above is first pure, then peaceable, gentle, willing to yield, full of mercy and good fruits, without partiality and without hypocrisy” (Jas 3:17). It’s the wisdom of the Word that practices purity. Elevates morality. Respects life. Honors the Creator. Loves without hypocrisy. Hates wickedness. And treats others with kindness and geniality. Reading the Bible and practicing its percepts will provide insight, understanding and wisdom to live and enjoy life in all its fullness. (3) Read Your Bible to Fortify Your Hope. G. K.Chesterton wrote that “hope means hoping when everything seems hopeless.” Our world is often a dark and dismal place. Wickedness abounds. Perversion is pervasive. And disrespect for Christian values seems to be increasing. Yet, the Bible offers us hope. Hope in God’s promises. Hope in a brighter tomorrow. Hope for the soul. Hope for a “new heaven and a new earth in which righteousness dwells” (2 Pet. 3:13). Indeed our hope is “an anchor of the soul” that provides safety and security during the storms of life. Without the Bible, we would be adrift on the sea of life without hope. Read the Bible. It’s God’s Word. It will provide all that you need for life and godliness (2 Pet 1:3-4).